Lawrence County Commissioners hired Michael Conly, Architura Corporation’s Principal, to do a study for the window replacement and HVAC coordination. After the study the decision making team found Mr. Conly to be trusting and knowledgeable Mr. Conly was asked to provide the design and oversee construction administration. The design was a special challenge. Mr. Conly found a supplier that could fabricate new double hung energy saving windows to fit the courthouse and yet remain true to the historic integrity of the building. 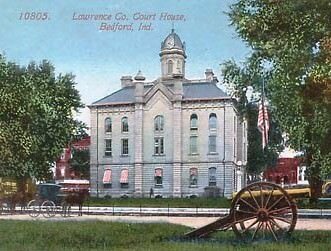 Much of Architura’s work is working on historic building restorations, including many of our beautiful courthouses across the State of Indiana. The commissioners and decision making team recognized the importance of bringing in the right architectural and engineering team to keep the project on track and on budget while keeping the look and feel of the historic building. Although there are many talented architects not all of them have the eye for historic restoration and building renovations that Michael Conly does. Architura is proud to assist Lawrence County with this unique project.